'Get Up With It' was Miles' last studio album before he took a long break, and shows him at the absolute apex of his mid-70s creativity. All the elements he had been experimenting with are here, crazy psychedelic guitars, Stockhausen influenced attempts to stretch time and space, futuristic polyrhythmic African grooves and bizarre, almost satirical de-constructionist takes on common blues, funk and rock licks all combine to make an album that was way ahead of it's time in the mid-70s, and still sounds modern to this day. Songs like 'Rated X' and 'Mtume' stand out with their polyrhythmic wall of wah-wah guitars, percussion, bass and distorted organ recreating a futuristic psychedelic African music. On 'Honky Tonk' the band stretches common funk riffs into pointillist abstraction by slowing down the time and leaving a lot of space between their interactions. 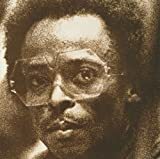 'Maiysha' opens with a loungey Latin groove that becomes strangely unsettling and menacing before the song eventually breaks into a harsh blues riff played at a numbingly slow tempo while psychedelic guitar wizard Pete Cosey's solo sounds like it was recorded on a tape that was underwater and slipping badly, this is absolute de-constructed blues from beyond hell. Another stand-out track is 'Calypso Frelimo'. This song takes up side three as it winds itself through different sections before it ends with a chaotic, almost punkish, double-time African jam that has gutarists Cosey and Reggie Lucas trading harsh distorted psych-funk licks with weird repeated spaghetti western type melodies. This totally bizarre song always has something new to hear in it's thick collage of almost incongruos sounds. Probably the best song on the album, and the most prophetic and forward looking, is 'He Loved Him Madly', a lengthy improvisation which takes up all of side one. 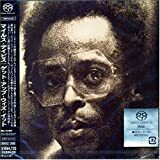 On this cut Miles presents two guitars, flute, bass, drums and percussion playing a patient and slow unfolding of musical events that is part Stockhausen and part raga before the percussion kicks in. Anywhere from ten to twenty years ahead of it's time, this song would pre-date much of the ambient, new-age and trip-hop music that would follow in it's wake. Brian Eno, who is often credited with creating modern ambient music, has often praised this song for what an effect it had on his own musical direction. It is really hard to describe this album and do it justice, words like rock and funk etc could apply to millions of albums, but there is no album like this one, fueled with a malicious sense of mischief, a dark sarcastic sense of humor and tempered with a deep love for music, and a love for those that feel as strongly about music as he does, Miles produced an absolute masterpiece, an album that never could, nor never will be repeated. Probably my second favorite Miles album after Big Fun, Get Up With It is one heck of a fusion record and one heck of a record in general. 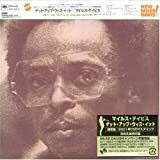 Miles delves perhaps further into the fusion area here and although these, like Big Fun, are all from earlier sessions they sound like they were all recorded for the same purpose. 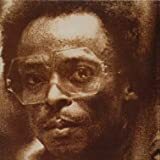 The pieces on this album like Miles other fusion albums are extremely fusion-esque and at times psychedelic but these tracks are far more spaced out and almost intellectual than the other records. McLaughlin, as usual, shines but even the guitarists from other sessions are extremely impressive. Miles rocks out on the organ in a couple of tracks and it really gives the album a quality that isn't reached in other jazz records. Seems to me that each track is incredibly concise in every musicians playing and that is an important part of the record. All-in-all, Get Up With It enters alot of unexplored territories in the jazz world and it's an incredibly enjoyable listen. Many did not get this record when it was released and it's easy to see why but that small cult who got it definitely knew what they were hearing.